Commentary on introduction to "The Christian Life"
The study of the Christian life is a noble and high calling for every believer. All books in the New Testament contain passages dealing directly with living the Christian life. Reinder Bruinsma is the author of the lessons for this quarter. In these lessons he deals with 13 aspects of the Christian life. Each of these points must be taken seriously and addressed Biblically. The introduction to the quarterly is entitled “Walking the Walk.” The author stresses the importance of both doctrine and experience, quoting two statements from the Bible to provide a basis for this idea. In this brief two-page introduction, the author confuses two very different things. 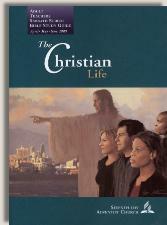 The author seems to equate experience with living the Christian life. Jesus, his apostles and others throughout the New Testament are careful to distinguish between the experiences one has and the life one is called to live. Our experiences do not define our life in Christ. It is Christ, his life, death and resurrection that gives definition to our experiences. In fact, it is the cross and blood of Christ by which the believer overcomes all circumstances and experiences in this life. Modern writers like John Stott, Watchman Nee, J. I. Packer, John Piper, C. J. Mahaney, C. S. Lewis, Oswald Chambers, A. W. Tozer, Dietrich Bonhoeffer (quoted on p. 118 of the quarterly) and numerous other Christian authors have provided an abundance of material expressing Biblical teachings as they impact the life of a Christian in a fallen world. On reading these modern Christian authors, there is a theme that is solidly front and center and from which flows the Christian’s desire to live in submission to a holy God. That theme is Christ, and him crucified. When comparing many of these modern Christian authors to the New Testament Biblical writers, the same reality is presented as the only foundation on which we can begin to build our life in Christ. How are we to abide in this present life? We are to abide in Christ. Nee provides a wonderful insight based on Romans 6:3. “… God has dealt with us in Christ. This is summed up in the apostle’s next statement: ‘All we who were baptized into Christ Jesus were baptized into his death’ (Rom. 6.3). What the Christian needs to live a transformed life is provided in Christ. When Christ was leaving this world, he promised that he would send another Comforter, the Holy Spirit. 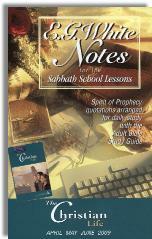 It is quite one thing to study the fruit of the Spirit, and the commandments of Christ that are contained in the 13 lessons of the Sabbath school Quarterly. It is entirely another thing to live in Christ, and to have Christ live in us through God the Spirit. Once one has received Christ and his baptism of the Holy Spirit one can then begin living a life of holiness. One item must be addressed before the lessons are underway. This is found on the cover of the quarterly. There is an image that shows Jesus standing and pointing, with four people standing with him and looking. Three of these people are failing to do what Jesus requires. They are looking away from this depiction of Jesus in the direction he is pointing while one man is doing what believers must do – what we are called to do, and that is not to look away from Christ but to look to Christ. In all false religion and false systems in this world, whether one acknowledges Christ as Lord or not, the Jesus that is taught is a way-shower, he is the one pointing the way. He is the one identifying for us, how life is to be lived. He is pointing to truth. These are all a distortion. Jesus is not the way-shower, He is the way. Just as when driving down a road one sees a sign stating your destination and how many miles to that destination. One does not pull the car to the side of the road and climb up that sign and hold onto that sign to reach your destination. One stays on the road, you stay on the way that brings you to your destination. Jesus is not pointing the way, He is the way. Jesus is not pointing out how to live life, He is life. The Jesus on the front of the quarterly is pointing away from Himself. The Jesus in the gospels points to himself because He is the life. Jesus does not point out truth, He doesn’t say this is truth, He says I am truth. Any Jesus that points out truth without saying I am truth, opposes the fact that Jesus is truth. The items to be covered this quarter are stated in the titles of each weeks’ study. Love, faith, hope, life, etc. Every one of these is an important area of the Christian life. But these 13 weeks do not include at least one week on being filled with the Holy Spirit so that one can be loving, faithful and filled with hope. It does not show the ultimate call of every believer to fall at the feet of the savior and worship Him. This is the highest calling. This is the Christian life, to fall and be broken on the Rock that He may receive all the glory, honor and praise. Jesus must be the origin, focus and final objective of all we stand for or attempt to accomplish as believers. In the 160 pages of the Teachers Quarterly, there are four pages that appear to present the centrality of Christ, His cross and His blood as the all-consuming passion of the believer. However, as each of these is addressed, the focus is taken away from Christ. The Christian life is the highest calling. It is never a life of things, even spiritual things. It is a life of constant worship and praise and joy. Man was created to glorify God. Our highest calling is in worship of God. Anything short of this is a striving and chasing after the wind. Jesus as the central focus of the Christian life is the central focus of all the New Testament writings about the Christian life. Modern Christian writers maintain the centrality of Christ and him crucified as the only true focus of a Christian and as providing the only basis on which we can hope to live a successful Christian life. The blood of Christ has dealt with our sins (what we do), and the cross of Christ deals with who we are by nature (spiritually dead). It is through the blood and from the cross that the believer operates successfully in this life. The Holy Spirit in us is the means by which we can live Christ-centered lives. Holiness is not the eradication of sin, but the separating of us by God to himself that enables us to live powerfully for his holiness. The image of Jesus on the cover of the quarterly is designed to take the focus away from Jesus. The Jesus of the New Testament only points to himself when speaking of the way, the truth and the life. The four pages of the quarterly that seem to promise a Christ-centered focus, actually result in the focus being redirected away from Christ. Worship and praise of our Lord is the highest expression of the life of a Christian. Anything short of that is a striving after the wind. May the Lord Jesus be your focus, your meditation and your only objective as you seek to serve him better. Copyright 2008-9 BibleStudiesForAdventists.com. All rights reserved. Revised March 21, 2009. This website is published by Life Assurance Ministries, Glendale, Arizona, USA, the publisher of Proclamation! Magazine. Contact email: BibleStudiesForAdventists@gmail.com.